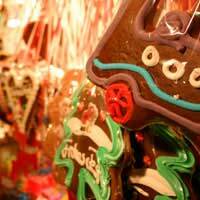 You could be forgiven for not immediately thinking of Germany when the subject of Christmas comes up, but in fact many of the Christmas traditions we all know and love originated in the country. Take the Christmas tree, for example: citizens of the German town of Strasburg were the first to cut down an evergreen, place it in their homes and decorate it. Christmas trees first appeared in German historical records in the early 17th century, and are called "Tannenbaum". Legend has it that the religious leader Martin Luther advocated the Christmas tree custom to remind his followers of the natural foundations of life in general and religion in particular. He is also said to have been the first one to decorate a tree with candles, thus initiating the trend for lighting up Christmas trees. Germans still love their Christmas trees. Every year people go out on the 26th of December to visit neighbours, friends and relatives to praise their trees. The tradition is called "Christbaumloben" meaning "Christmas tree running" and consists of ringing people's doorbells, going into their homes and loudly proclaiming "What a beautiful tree!" In exchange, the owner of said tree offers the admirer a shot of something strong, and maybe a cookie. This goes on all day long and Christbaumlobers sometimes visit as many as 15 different houses: a nice way of keeping in touch with their loved or just local ones - and a great way of getting really drunk very cheaply. Don't let this fool you, though: the German Christmas tradition is still steeped in religion. That is why kids receive all their presents before dinner on Christmas Eve: so they can focus on celebrating the birth of Christ afterwards. Many families still go to midnight mass, and Christmas day is generally a quiet, thoughtful day. There is no Santa Claus in Germany either: children write letters to "Christkind" instead. This "Christmas Child" is a beautiful fair-haired angel dressed in white, sent down from heaven on Christmas Eve to distribute gifts. One of the most famous German Christmas traditions is the Christmas market. Anywhere you go in Germany, you will come across beautiful wooden stands lit up with candles and sparkling lights, selling handcrafted Christmas ornaments, mulled wine (or "Glühwein", as it is called locally) and a wide variety of Christmas pastries. The most famous one is of course the "Lebkuchen" (spicy gingerbread, first baked in Nuremberg in 1395), but Christstollen are very popular, too. The first Christmas market was held in Nuremberg in 1628. The tradition has since spread all over the country, the most famous Christmas markets being the ones held in Nuremberg, Cologne and Munster where no less than six Christmas markets transform the ancient town into something of a winter wonderland. Germans don't just eat their beloved Lebkuchen, they also build houses with them. Well, not exactly life-size mansions (though some ambitious builders have tried their hand at those), but small, intricate models of bigger buildings. The "Lebkuchenhaus" was first created in the early 18th century - and eaten a few days later.